Fabric Paper Thread: April Showers Bring April Flowers! Beautiful Spring! (Beautiful memories for me.). I would think that any gathering in a place named Poet’s Cove would be blessed! The name alone makes me happy. Lorrie - we have shooting stars here, but it will be another month before their heads will be nodding down by the stream. That heron is very intent - and it paid off! I love to find places like Poet's Cove, where you can get away and yet still have the 'luxury' of good eats and good company. Thanks for linking to Mosaic Monday. Poet's Cove is a very poetic name, no wonder you were fascinated and it also reflected in your text! So much beauty. They sell Shooting Stars also in Finland, but I don't have that in my garden - I sure should because it looks so delicate & beautiful. Happy Easter week Lorrie. 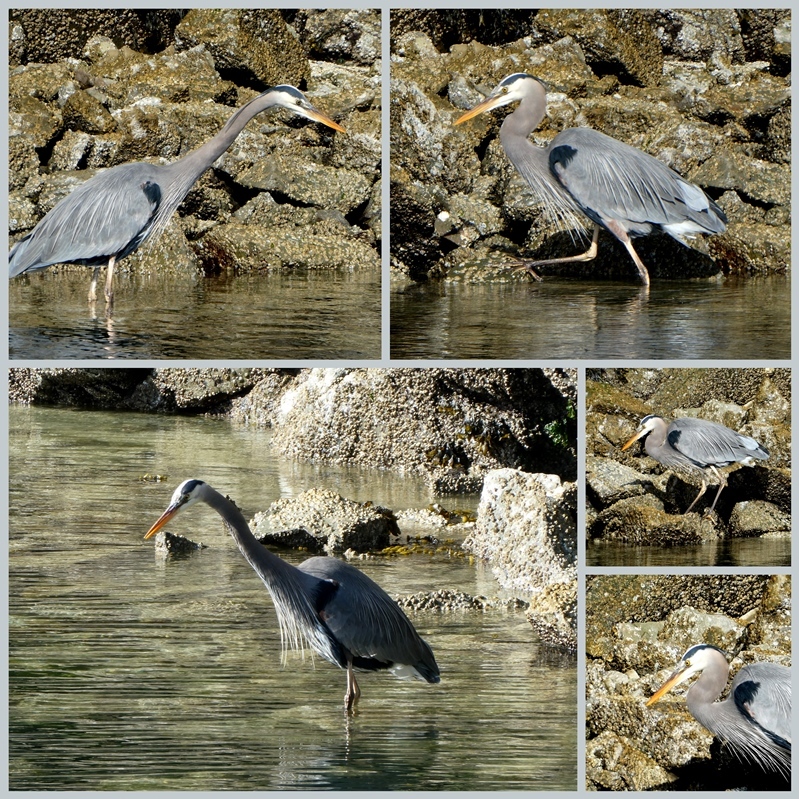 We have Great Blue Herons here and they are always such a joy to see. What graceful creatures. A spring weekend spent at Poet's Corner sounds delightful! Poet's Cove looks like a wonderful place to spend time. Wish I had some of that sourdough bread right now to have with my morning coffee. Have a good week ahead. Enjoying your lovely photos, the flowers are beautiful. We have not had enough rain here so not many flowers. Hello, lovely flowers and blooms. Gorgeous photos. Poet's Cove sounds great. Happy Easter to you and your family. Enjoy your day! Have a great new week ahead. I have never seen Shooting Stars here, but am going to research them to see if they grow here. They are so pretty. Beautiful photos, and the food! The tulips are beautiful and I love that big Great Blue Heron! Sounds like a wonderful weekend. Enjoy your day! I don't think that flower grows here but I'll look it up too! Hugs! Spring looks beautiful where you live. Oh, how lovely! The flowers are so beautiful and what a wonderful place to take a walk. No pretty blossoms here yet but it's only a matter of time. Poet's Cove sounds like a splendid place to spend time with friends and what a feast you had! We have lots of herons here. The park we go to in the city has a wonderful harbour where next month the boats will be sailing and we will have many birds, including herons, to watch. Happy Easter, Lorrie! No, we have none of those first flowers featured...more’s the pity. The heron reminds me of Arthur Treacher. Yes, I do believe you would wave those beautiful branches of cherry blossoms. I’d wave pine boughs. 😉 My goodness! You do eat well. Nothing like friends and conversations that stretch us. We have a Great Blue Heron that visits our small creek, off and on. We love to see him! Gorgeous cherry blossoms, and primulas! Lovely floral images. Life would certainly be boring if friends agree on everything! Looks like a lovely spot to spend time with friends. The blossoming trees are such a treat. Love the blue heron! My mouth is watering just reading your menu items. Have a wonderful Easter! Great shots! I love the heron. The spring greens are such a welcome sight at this time of year. The shooting star flowers are so pretty. Don't think I've seen them around here before. I do find the blue herons interesting to watch. We had one that would visit the goldfish pond at our last house. The wingspan when he would come in for a landing always amazed me. We do have shooting stars - I've only seen them in the mountains.